I've come to recognize that different people like different kinds of stories. I see this in our church library---there are some who love the gentle romances with a gripping story, and those who love stories that are more graphic and have more violence. The book I am recommending today is one for the first group---those ladies who like a more gentle story, but just as gripping with adventure and romance. 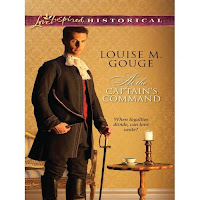 At the Captain’s Command by Louise M. Gouge is a delightful historical set during the Revolutionary War. Dinah Templeton, living in an East Florida colony, feels outcaste from her family. Her family is loyal to England, but Dinah has the feeling there is something certain members of her family are not telling her. There is also a great deal of talk about the infamous pirate Nighthawk who plagues the coastline. To protect those loyal to the crown against this growing list of revolutionaries is his Majesty’s Royal Navy and the Dauntless commanded by Captain Thomas Moberly. Attraction grows between Dinah and Thomas quickly. Some in their circle say they are perfectly suited to one another. But Dinah has promised herself she will never marry a navy-man. Besides, it appears that Thomas is not interested in any romantic attachment to her anyway. How could he when he is of noble blood and she is not. Dinah and Thomas’s dilemma is set at a time when many in the American Colonies are throwing in their lot with the revolutionaries to win their independence. It’s a time when brothers could secretly be on opposite sides. Dinah and Thomas must decide if their love for one another can bear the tug of loyalties from different directions. And Thomas must sort out in his heart if God hears the prayers on 2 sides of an issue—whose voices are heard in Heaven, those who wish to remain loyal to England or those who desire a free land of their own? 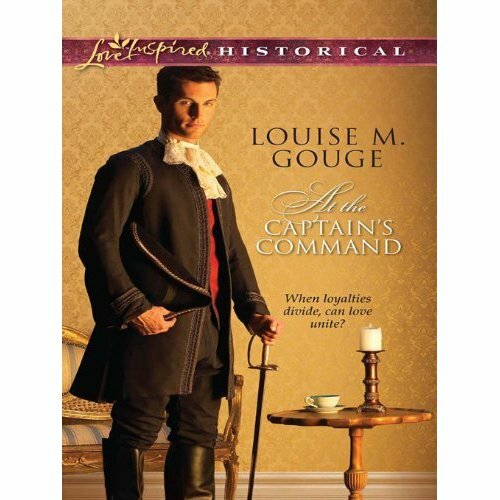 Author Louise M. Gouge seamlessly weaves historical detail into her narrative, so that you feel as though you are there. You can smell the sea air, the rich humid Florida coastline, and feel the snap of canvas as the Dauntless sails the seas. The author writes brilliant dialogue that sounds as if someone from that era is speaking, and yet it is easy on the ear. She drew me in instantly and kept me turning the pages, so that I came to care very much about her characters. I found this time and setting to be a fresh new take of the War of Independence, and a novel I heartily endorse. No wonder Louise M. Gouge is an award-winning author several times over.